The question was asked: Which is faster, the Radeon HD 4670 AGP or the Radeon HD 3850 AGP? They have very comparable specs on paper, but the 4670 was introduced as a replacement of sorts for the 3850. So, I decided to test it real quick. RV730, the core inside the Radeon HD 4670. This is cut down from the extremely powerful (for the price) RV770, a nearly full redesign of TeraScale, with stronger ROPs and significantly better MSAA resolve hardware. 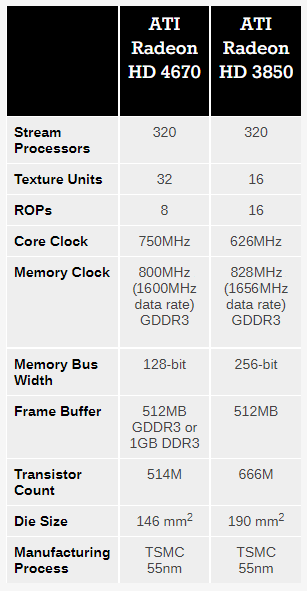 The active shader count is comparable to RV670, but some things have been changed around as can be seen below in the specifications chart. A slimmer backend and memory interface choke a lot of potential out of this chip, but for a reason. 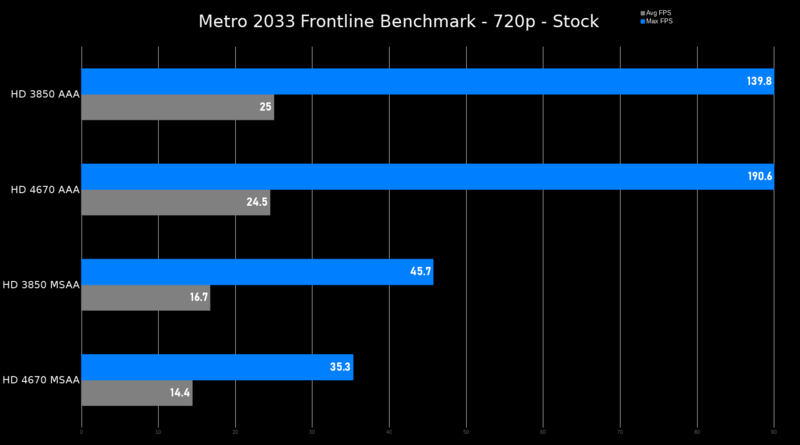 If it had been much better it would have dethroned the much more expensive Radeon HD 3870, which AMD clearly did not intend to do. 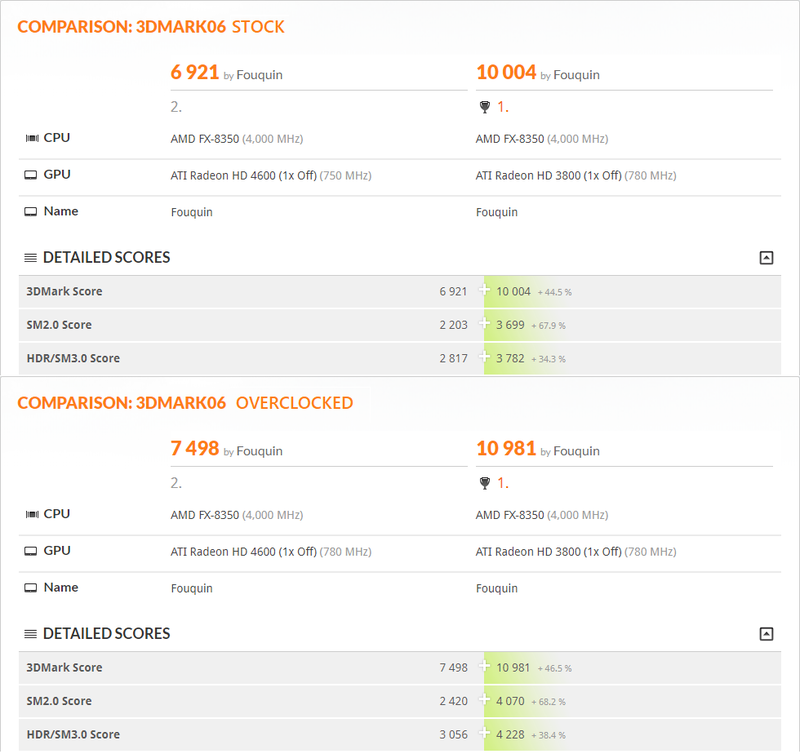 A quick note on clocks, I tested both stock and “overclocked” results. 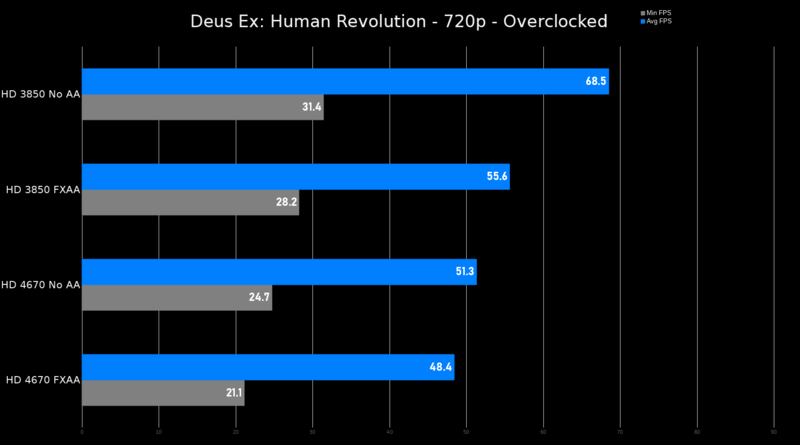 The overclock is the nearest matching clockrates that both cards were stable at. It’s possible that either card could have been tweaked further, but for the sake of leveling the playing field I chose to keep things “clock-for-clock” as it were. 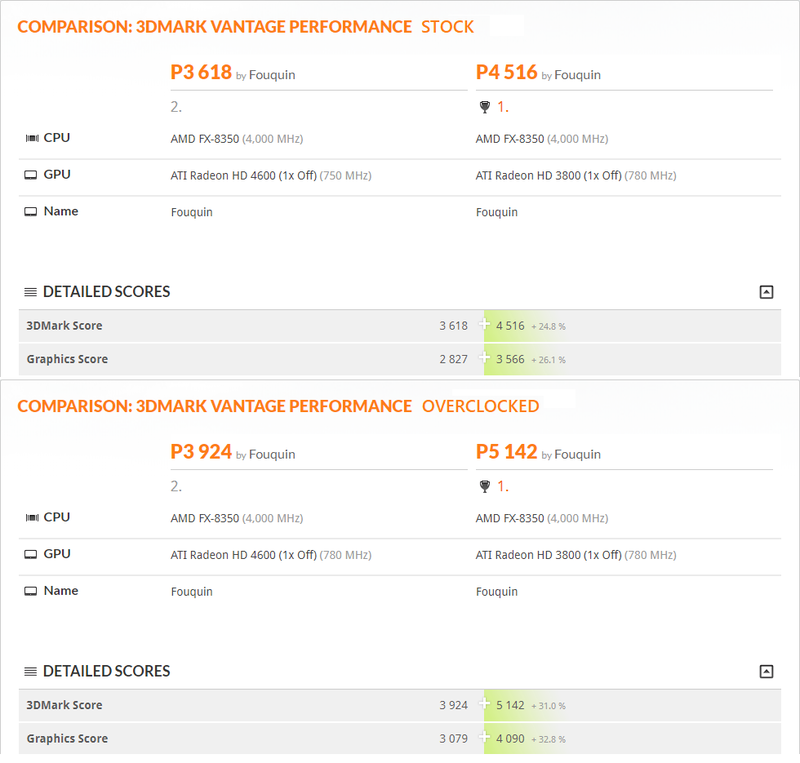 To start I ran 3DMark06 and 3DMark Vantage. This went about how I expected. 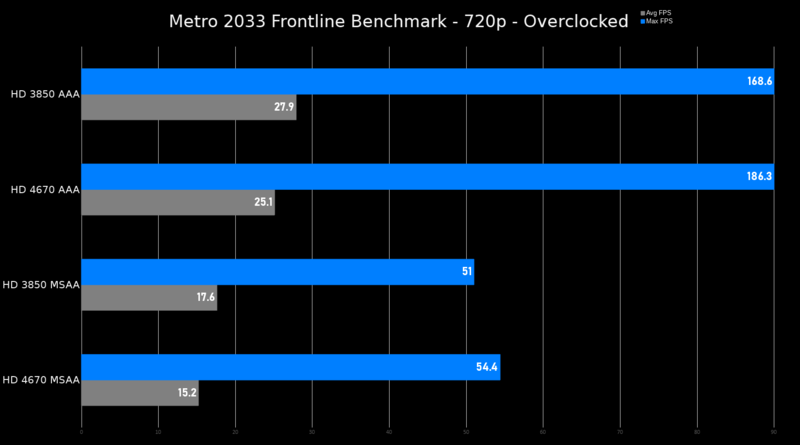 The Radeon HD 3850 takes the day. I already knew these results would turn out this way from previous testing, however the question wasn’t how the cards performed in canned benchmarks. The question posed was, "Which is the fastest for gaming?" Starting with Deus Ex: Human Revolution. This game is great both for playing and for testing obsolete graphics cards that nobody sane cares about. 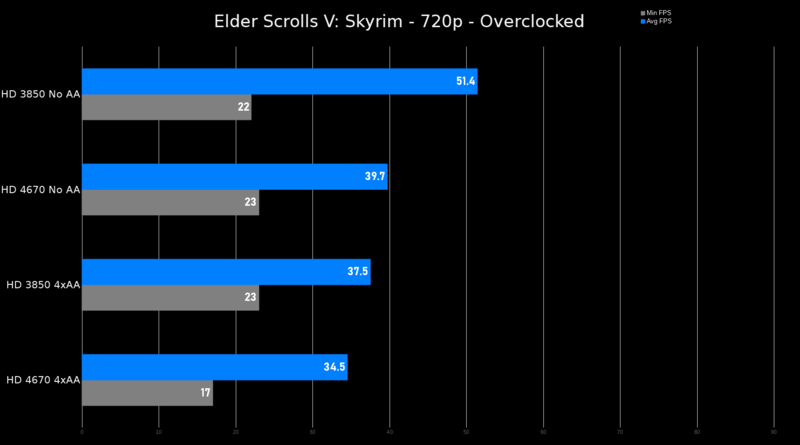 It offers plenty of punishment for older hardware and doesn’t have an FPS cap to blockade performance testing on newer cards. We’re running at 720p with the settings above in sets of three. Three runs with AA, three runs without AA, and averaging our results for each. Minimum FPS is read off the actual minimums reported by Fraps. 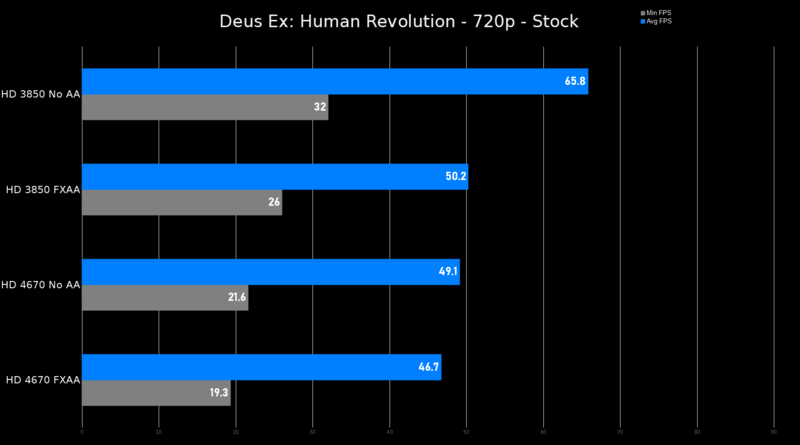 Another great test for older hardware, and one of the first DX11 games on the market with a built in benchmark. It is suitably punishing for our hardware, especially the Radeon HD 3850 because it has no option to disable anti-aliasing. I’m running the Frontline benchmark, results are again averages of 3 runs for each AA setting. This time maximum FPS is in place of minimum due to the benchmark always reporting exactly 4.19FPS at Frame 7 of the test regardless of hardware configuration or settings. 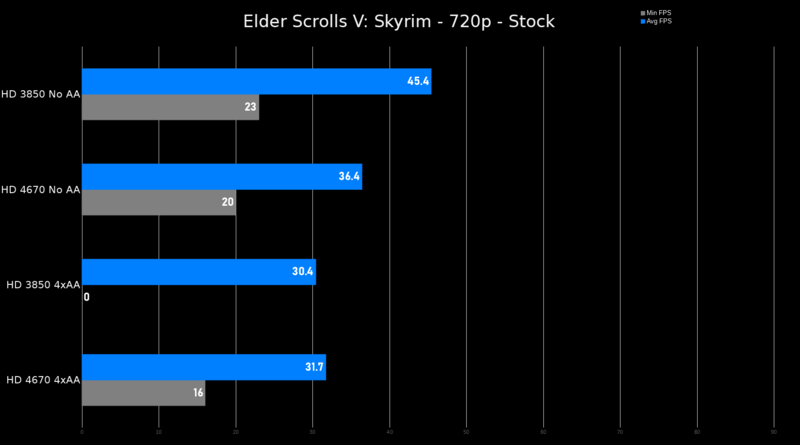 The charts are sorted by average FPS still. I don’t need to explain why I ran Skyrim. Results are averages of 3 runs. Testing was done in the wooded outdoor area of Fort Greenwall running a predefined path from the town, around the fort and back into town to the fire pit. Again, averages are from 3 runs each, minimums are the actual minimums reported by Fraps. The Radeon HD 3850 was destroyed by this game, and not in the way you’d think. The lighting was constantly bugged out, frame drops were frequent and random skips, hops, and screen tears were prevalent. Most issues were solved by removing AA, but the lighting glitch remained through every test. The Radeon HD 4670 had no such problems. Obviously that’s not much testing, but I really didn’t want to go all out on this. It was mostly out of curiosity, and to get a general idea of performance between the two. And to that end I would say that if somebody were dead set on getting the best GPU they possible could for a system constrained to AGP 8X, that the Radeon HD 3850 would be the better option overall. Nice job! That’s incredibly comprehensive. Do you have a place to find all of your tests? Hope y’all don’t mind me practicing my necromancy skills. I don’t. I actually wrote down all the results by hand to begin with, then averaged them and put those results on the graphs. Not the most efficient way of doing it, but I basically did this on a whim and didn’t set up a spreadsheet or anything to store results in.